This course is designed for everyone who is interested in improving their dive theory knowledge. PADI Divemaster candidates, IDC-bound Pros, IDC Staff Instructor candidates and Course Director Training Course applicants can use the program to prepare for their course exams. Divers of all levels can take the course for personal enrichment. This is an eLearning Course, so you can start immediately! After enrolling, PADI’s eLearning system presents you with interactive presentations that include videos, audio, graphics and reading. Short quizzes let you check understanding of the presented information before moving on. This lets you go through the program efficiently and at your own pace. End-of-section exams verify your mastery of the entire topic and are automatically scored. 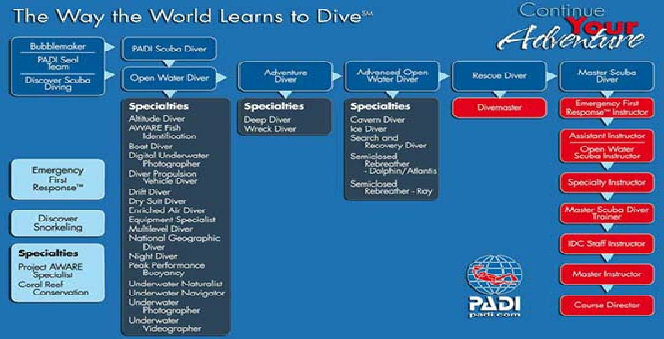 Unlike other PADI eLearning courses, Dive Theory Online does not have a practical component. Completing the online course material is all that is required.